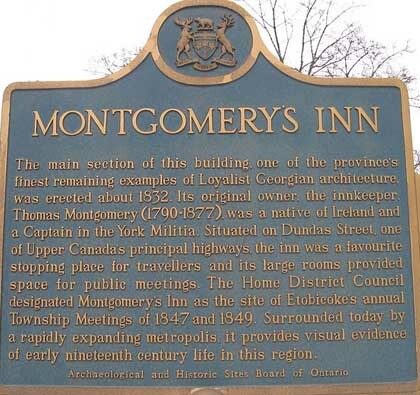 Montgomery's Inn is a historic home and inn in south Etobicoke in the city of Toronto, Ontario. Built in 1832 in a Georgian style with later additions, the inn has been restored to an 1847 period, and operates as a museum of the City of Toronto. "I grew up very close to the inn and was fascinated by it all my life. I literally must have visited it monthly from the time I was 5 until I was 25 (when I left the city). I can still tour it by heart in my memory. In all of the hours that I spent there I never felt it was haunted, but I definitely felt drawn to be there constantly. The only unusual experience I had there was in the 7th grade. As a class assignment we were asked to write a short story and I chose to write the story of a maid who worked at the inn. I got a very good grade on my story and my teacher sent a copy to the Inn. The next time I went to visit, the tour guide at the time (who knew me very well) was very excited and pulled me into an archive room to show me some of Thomas' records that had never been on display (so I was unaware of them). The records concerned the life of a maid who had been employed there and my story mirrored her life almost exactly... even down to her name - May Evans. Anyhow, I certainly love the Inn and would be most happy to hear any information that you find on it. I miss it dearly now that I cannot visit it - I look on the Inn as a warm old friend." To read about the possible ghosts of Montgomery's Inn please click on the link, and a new window will open up for you. Please click here for the Montgomery's Inn official website.